Large Crystal Diamante set Brooch. 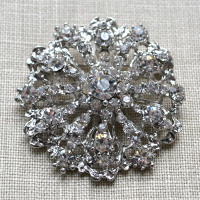 This beautiful brooch can be used to accent wedding shoes, sashes and many other items. Supplied with a pin on the back. Size: 45mm fantastic to adorn wedding dresses for a touch of sparkle.